When will the resurrection of the dead occur? Over the past several decades, some theologians have called for a reconsideration of what had become the traditional response to this question, that the resurrection would occur "on the last day" (John 6:40), at the end of the world. They propose instead that the time of the resurrection be identified with the individual's moment of death ("resurrection in death"). 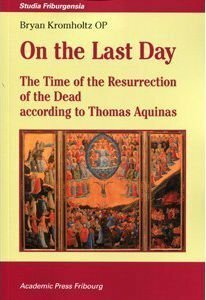 However, St. Thomas Aquinas consistently taught that the resurrection will occur when Christ returns at the end of the world, for everyone at the same time. In this, Thomas highlights the theological significance of human persons' connections with Jesus Christ, with the created world, and with one another. In On the Last Day Bryan Kromholtz explains how Thomas's attention to these three dimensions (Christ, cosmos, and community) anticipates many current concerns and can contribute to a better understanding of resurrection for today, one that more fully accounts for the Christological, corporeal, cosmological, and ecclesiological aspects of eschatology. Fr. Bryan Kromholtz, OP, is Assistant Professor of Theology at the Dominican School of Philosophy and Theology, Berkeley, California. He completed his doctoral studies in theology at the University of Fribourg, Switzerland, in 2008. Collection: Studia Friburgensia, vol. 110, 548 pages, paperback, $89.95.